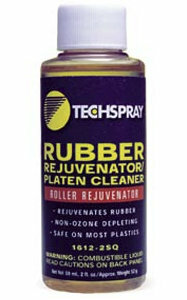 Techspray's 1612 Roller, Rubber Rejuvenator is one of janelonline's most popular products. This citrus-based solvent is designed to clean and revitalize rubber rollers and platens. It successfully improves a rubber roller's grip and reduces misfeeds and jams. Applications include: electronic repair, the maintenance of office equipment, and plant maintenance. To shop this product click here or to shop the entire Techspray product line click here. Janel is proud to be an Authorized Distributor of Techspray Products.